Xkcd-excuse.com - Your own excuse now in Xkcd format! 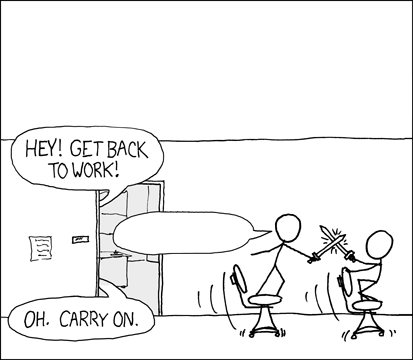 The easiest way to get your slacking excuse in hip xkcd format! Original image created by Randall Munroe from XKCD. Released under Creative Commons Attribution-NonCommercial 2.5 License. XKCD-Font created by iPython team. Released under Creative Commons Attribution-NonCommercial 3.0 License. Code for displaying and generating images freely available in not one, but two GitHub repos: xkcd-excuse-front and xkcd-excuse-generator.